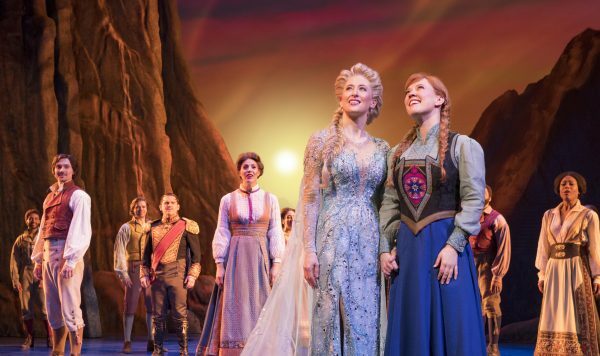 Neither the riskiest nor the safest adaptation, Disney’s Frozen proves solid. Jordan Teicher reviews. Adapting a Disney property for the stage is always a high-stakes endeavor. But Frozen—a cash cow with legions of militant young fans—is no ordinary Disney property. Finding the sweet spot between “replica and reinvention,” as the New York Times’ Michael Paulson put it last year, is a uniquely consequential—and delicate—task. That’s a lot of pressure for a creative team helmed by director Michael Grandage. But they seem to have been able to let it go and have some fun nonetheless. Frozen manages to be neither a carbon copy of the blockbuster movie, nor an entirely novel product. It includes new songs—and even a new species—but the key elements that made the movie so successful remain largely intact. As a result, the show will likely satisfy—and occasionally surprise—its core audience, whose young constituents you’ll find flooding the lobby at intermission sporting branded Frozen backpacks, tee-shirts and the occasional tutu. Its most immediately apparent success is its evocation of setting. Christopher Oram’s scenic design is mostly classic Disney stuff— there are 20-foot-high ceilings, cartoonishly lovely wintry landscapes, and, at one point, a full moon the size of a Buick—but there’s also an authentic Nordic vibe rooted in the aesthetic. While Frozen’s Arendelle is fictional, it’s meant to evoke the Danish world of Hans Christian Andersen, the writer of the “Snow Queen” fairy tale, upon which Frozen is loosely based. The show’s clearest effort to lean into this sense of Danish-ness is a new song, “Hygge,” an ode to the Danish concept of coziness, which came to the wider world’s attention in 2016 after a rash of books and articles on the subject flooded the market. Adults who remember this trend may enjoy the niche cultural reference, while kids will more likely enjoy the funny accent of Oaken (Kevin Del Aguila) and his merry chorus of sauna-bound hygge-ites, who race around the stage gleefully swatting each other with branches. No matter your point of entry, the song is unmistakably stupid and undeniably fun, and among the most memorable of the new crop of tunes in the show. The enthusiasm for cultural authenticity does, in some respects, get a bit out of hand. The trolls from the movie have here been replaced by “hidden folk”—a scantily-clad, dread-locked bunch with tails and glowing eyes supposedly inspired by characters of the same name from Scandinavian folklore. They sing and dance just fine in their big moment, the comic “Fixer Upper,” but considering Disney’s less than stellar record of indigenous representation, their presence is just ever so slightly uncomfortable. What exactly did the trolls do to deserve the ax anyway? Getting the ax, as it happens, has been something of a theme in this show’s production history. It tore through multiple directors, choreographers, set designers, and Elsas before settling on this current line-up. It’s not hard to see why Caissie Levy ended up with the Broadway gig. Her voice is stellar—on par with, if not better than, Idina Menzel’s. But overall her performance is slightly stiff, a fact that becomes most apparent at the beginning of the showstopping power ballad—and bane of many a parent’s existence—“Let It Go.” For the first half of the song, Levy appears a bit aimless on stage, but by the time she performs a lightning quick costume change to accompany a climactic modulation she finds her footing and powers through to the first act’s satisfying conclusion. As Anna, Patti Murin presents a counterpoint Levy’s relative rigidity. Her charm is on full display in “Love Is an Open Door,” a giddy duet with Hans (John Riddle) that includes a delightfully exuberant dance break choreographed by Rob Ashford. This being a Disney production, of course, there’s plenty of energy to go around on stage, and plenty of magic. Elsa’s icy powers are nicely rendered with both computer graphics and tactile stage elements (with additional support from a crackling soundscape by Peter Hylenski). Andrew Pirozzi, as Sven the reindeer, is eerily convincing in a full-body costume that allows him to move about realistically on all fours. And Greg Hildreth is a peppy and likable Olaf, who somehow manages to make audiences forget he’s connected by the feet to a snowman puppet the entire time. Ultimately, the show is neither the riskiest nor the safest adaptation one can imagine, but it’s a solid one, a product that skillfully toes the Disney line. It will thrill some little kids, empty their parents’ wallets, and do nothing to threaten Frozen’s continued status as a force of nature.